Summer in New York City. Andre Allen, groundbreaking stand-up turned bottom-of-the-barrel comedy actor, is in town on a press blitz promoting a misbegotten, Oscar-bait vanity project about the Haitian Revolution (poster pull quote: “Interesting”) that has the bad luck of opening against the new Tyler Perry movie, in which Madea gets trapped in a haunted house. Andre, years sober and convinced that whatever edge he had as a comedian left with the booze, goes from interview to interview, accompanied by Chelsea Brown, a journalist who’s working on a profile of him for The New York Times. Later that evening, Andre is set to fly back to L.A. to prepare for his wedding to a reality TV star. This is the basic setup for Top Five, a disorganized, dawdling mess of a movie that is rarely anything less than charming. 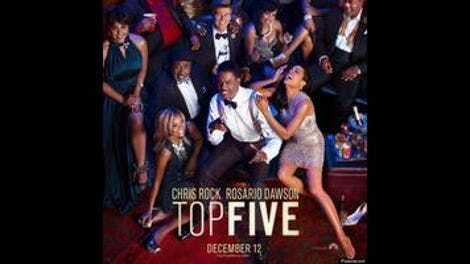 Written and directed by Chris Rock, who plays Andre as a kind of what-if version of himself, Top Five is a collection of observations about what it means to be a black artist (the title refers to Andre’s habit of asking people to name the greatest rappers of all time) and what it means to be a comedian, shaped into a ramshackle romantic comedy of creaky clichés. Sometimes working in the locked-in, long-take talk mode of Richard Linklater’s Before cycle and often trailing off into flashback tangents, it’s hit-or-miss, full of name-checks and cameos and leaden bits that abruptly burst into funny ones. Louie-esque miniatures—like an extended bit where Andre recounts a debauched, demeaning weekend in Houston in 2003—roll into bits of broad showbiz satire and lame relationship truisms lead off into raucous group improvs. A lot of it doesn’t work, but there’s just so much of it here that it’s hard not find something to like: Cedric The Entertainer as a cough-syrup-sipping Houstonite; Andre expounding on his theories about where Tupac’s career would have gone if he were alive today (“the bad dark-skinned boyfriend in a Tyler Perry movie, kicking Jill Scott down a flight of stairs”) and how Planet Of The Apes killed Martin Luther King Jr.; DMX crooning Charlie Chaplin’s “Smile” through the bars of a jail cell. Digs are taken (Perry, reality TV, the junket-interview circuit), praises are sung (Pryor, Cosby, Chaplin), and rappers are argued about to the point that a viewer occasionally forgets that they’re watching a latter-day rom-com founded on a Sullivan’s Travels riff. And yet, there it goes, meandering from the unpromising first meeting to the warm-up to the family get-together to the manufactured conflict and the symbolic gesture that resolves it. Chaperoned by childhood-friend-turned-valet Silk (J.B. Smoove), Andre and Chelsea (Rosario Dawson, as confidently easygoing as ever) walk, talk, and eat lots and lots of greasy food in between run-ins with relatives, celebrities, and gawkers. He asks her not go soft on him, and she doesn’t, asking about his alcoholism and his impending marriage. She’s a recovering alcoholic herself and a single mother and a longtime fan who shares Andre’s contempt for the movies that made him rich, a series of action-comedies about a talking bear who joins the NYPD. They have a palpable chemistry and they look good together—she in a sleeveless floral print, he in the kind of leather sport coat only a rich man would wear in public, both handsomely framed by Lars Von Trier’s current cinematographer, Manuel Alberto Claro. From a certain angle, the movie’s structure resembles the segues of a stand-up set, with a routine about what it’s like to be black and a celebrity leading into a bit about pop culture and then some material about marriage, family, and addiction, with cameos substituted for impressions. It’s nowhere near as seamless as that comparison suggests, but, in its best moments, it feels that raw and unvarnished.